A couple of weeks ago, I attended Belk's Girls Night Out to support blogger buddy Alexis Barton of Same Chic, Different Day who was hosting the event. 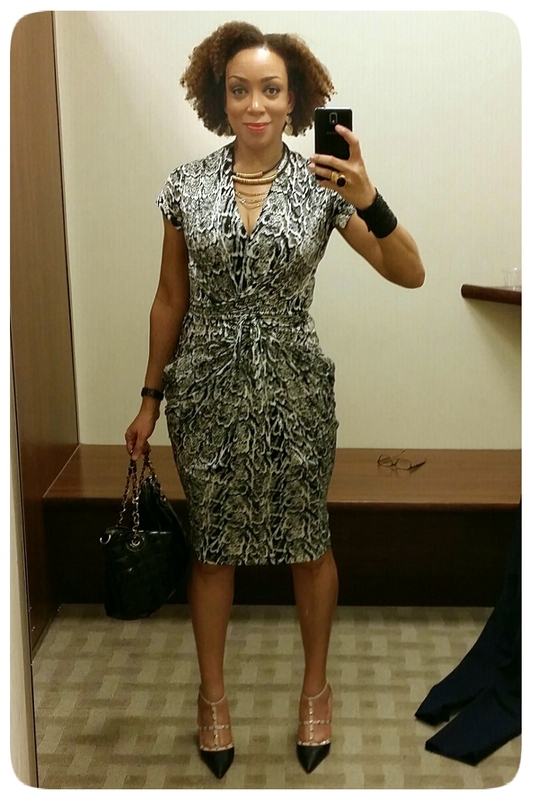 I wore an oldie, but goodie - Vogue 1258 (Out-of-print now). I re-discovered this dress about a month ago as I was purging my closet preparing donation bags. I tried it on and it fit better than it originally did, so into rotation it went! 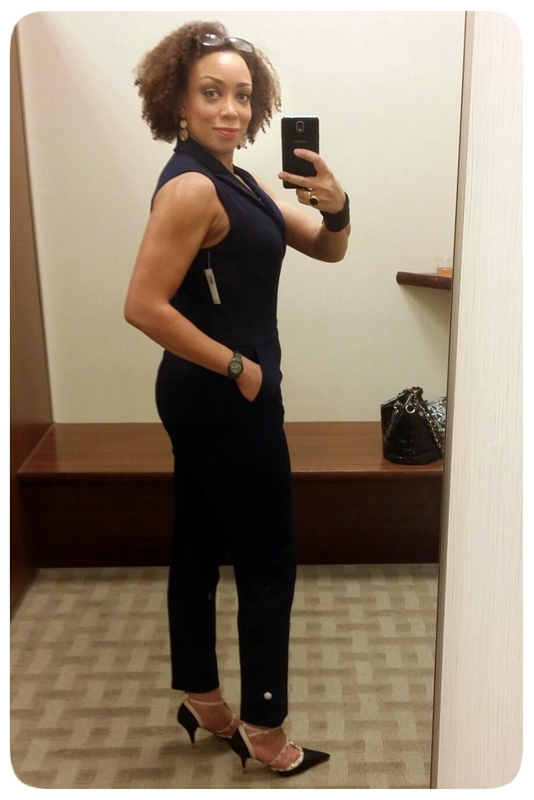 So while at Belk, I was there absorbing the atmosphere and sipping on wine, I did some exploring and some trying on! 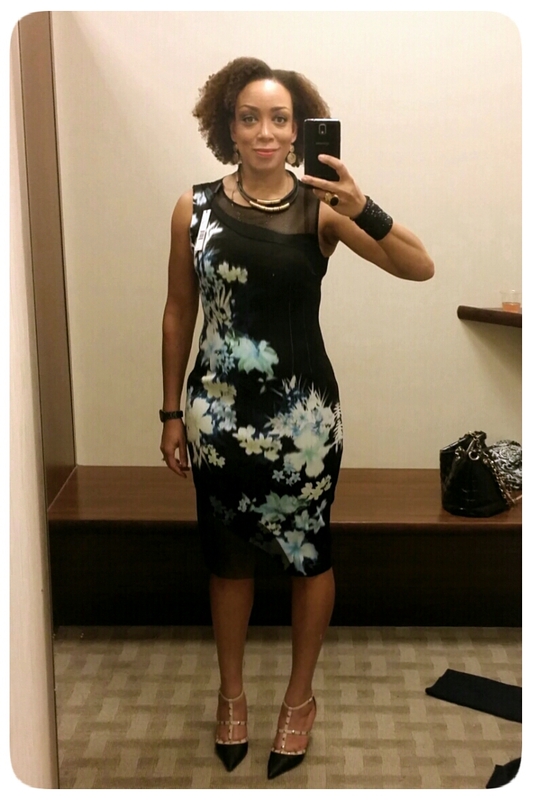 This fabulous Elie Tahari Emory Floral Print Sheath Dress - $428, jumped off the rack at me! I had to try it on! It's neoprene and mesh! A floral neoprene at that! Can I just tell y'all that I've been searching high and low for a similar print and I've had no luck thus far. But I'm not giving up. I absolutely loved the details. This is a dress that can easily be made. I could use a ponte knit or a stretch twill, but I really want a floral neoprene on a black background. Notice how the darts are sewn. I hope you can see it. On the inside, the seams were left raw. 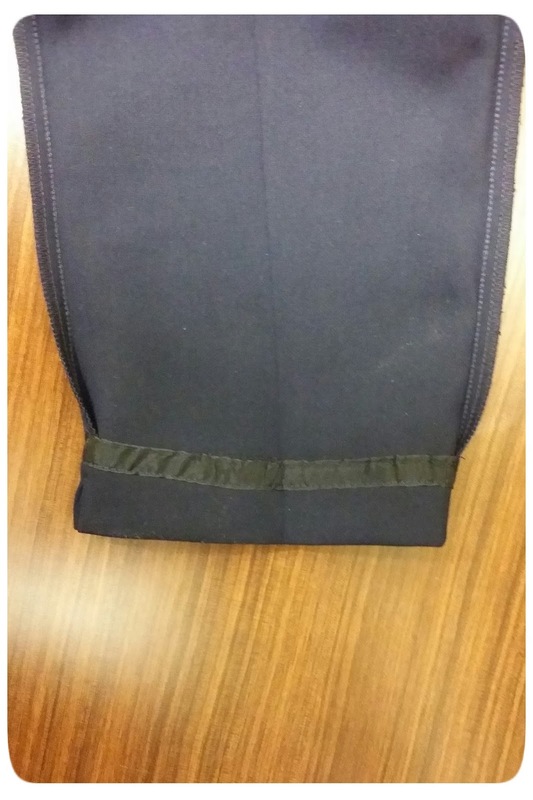 I've noticed that in ready-to-wear, neoprene is never finished on the inside. And on this dress, nor is it hemmed. I also wanted to try this tailored jumpsuit. What drew me to this is that it has a front invisible zip, even though it's a little low-cut. I've never really had much luck with ready-to-wear jumpsuits because due to my height, they always seem too short in the rise. But this one fits well and it was even comfortable when sitting. And I was also impressed with the length. It stopped where it was meant to according to how the model is wearing it. 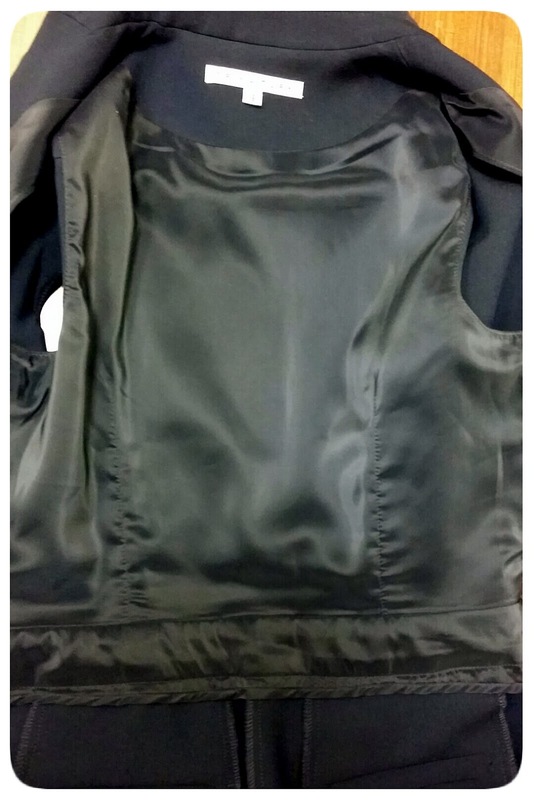 The bodice of this jumpsuit is fully-lined with a facing. And they even used hem tape. This is a detail that I don't often see. And of course, I had to buy something and what an amazing buy it was! 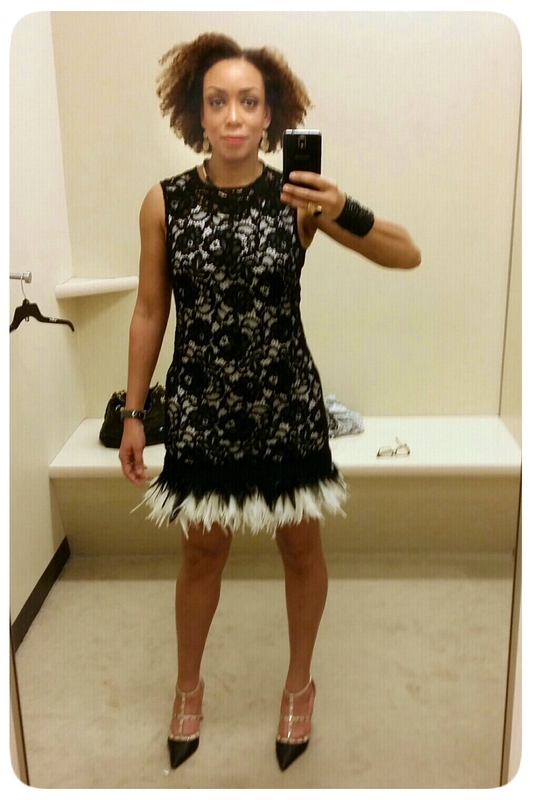 I found the DKNY Feather Hem Lace Dress that originally retailed for $495. Brace yourself... I found it on clearance for... $19.98! Yes, 20 bucks! I paid for this dress with pocket change! I very rarely buy ready-to-wear, so this purchase makes it worth my while! Love all them great style as always! Great score on the dress! It looks fabulous on you! Hi Erica, LOVE your new dress! Any idea where to buy the mesh fabric? BTW - you look amazing. Diane, I'm seeing mesh everywhere. In stores like Hancock and Joanna, it's usually near the swimwear fabric and athletic fabric. And Mood also has a good selection. Thanks! EB, brace yourself for people petting the hem of your lace dress! Such a steal..from from $498 to $19.98! 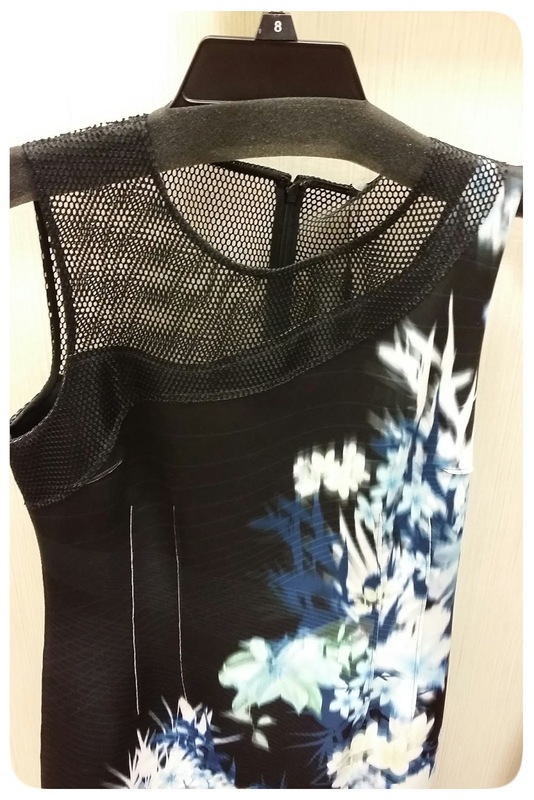 Btw, I've been seeing neoprene and mesh dresses at Nordstrom Rack. They're very fitted with zippers. But I haven't looked closely. Now maybe I will. Gorgeous Fabrics has floral neoprene if I recall. You look great in all of these! I can't believe the deal you got on that dress...wow. Erica, you are rocking these outfits! And those arms...I see those guns, chica! Keep up the good work! Such an inspiration. As a woman in her 40s, it's nice to see someone around my age getting fit - it lets me know that I can achieve this as well. You look amazing as always. I'm inspired by your sewing as well...as soon as I get some time, I will be back in my sewing room. (I gotta get past my licensure test for counseling first...then I'll have some "me time" for sewing). Thanks Zina and good luck with your testing! Beautiful outfits and you've definitely slimmed down. You look amazing! I love that jumpsuit on you! I think it looks better on you than on the model... And great dress, it's always fun to rediscover things in your closet! You look amazing in all four outfits. That was an awesome deal on that dress. I am loving all the outfits especially the first dress. You look amazing! Where are your shoes from? Those seem like the perfect pair. Thanks Sanja. I think Shoe Dazzle. That on is great. Thanks Jeanne! Looking good Erica! I love to try on high end fashion too, and examine how it's made, so thanks for the peek inside.Why copy Target when you can copy Prada? 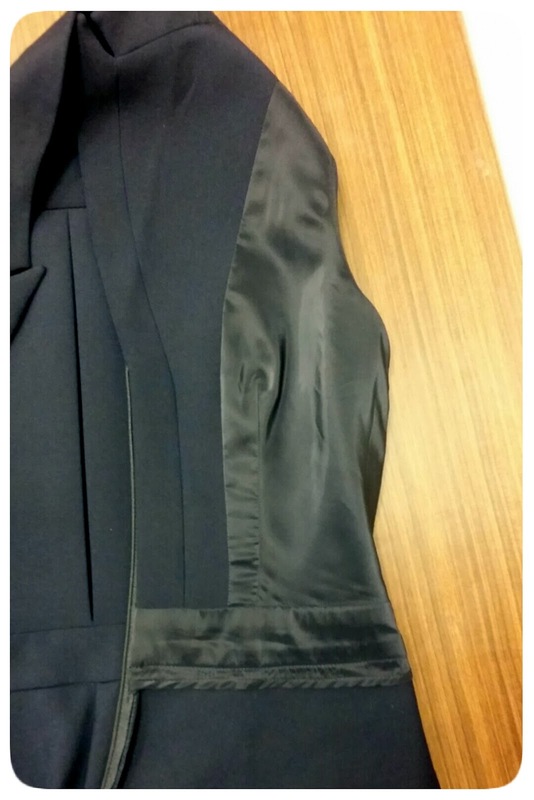 Thanks for sharing your experience - especially the inside garment shots! The insides are such great inspiration! Girl, you are looking amazing in all of these! I especially like the jumpsuit and the feather dress. I hope you get to wear that dress someplace fabulous! I still am! Thanks onefromphilly! Haven't been reading any blogs regularly lately. Just tuned into your 3/27 entry and WOW! You look amazing. Everything you tried on, and the dress you wore to the event, look wonderful on you. And those biceps! You have the most beautiful arms! That feather dress looks gorgeous on you! For $20...that was a steal! BTW...love your style and you look FAB! OMG you SCORED on that purchase! I feel your pain of jumpsuits. I'm the same way. 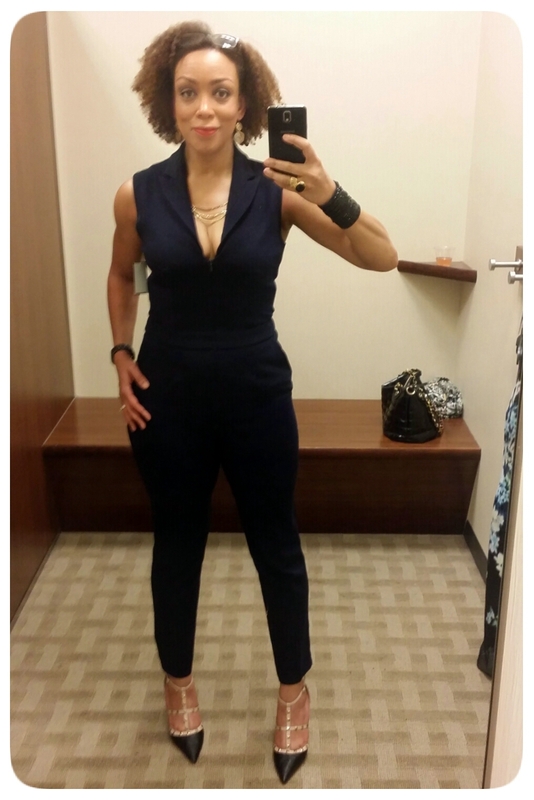 At 5'9" I have only been able to fine ONE jumpsuit that fit me properly). I hope you find that neoprene fabric, too. Just like you, I've never seen them hemmed. I got a couple of dresses from Nordstrom Rack and they weren't finished. Had I not been a sewing little something, I wouldn't have noticed. Your legs are killing it in that last dress!